Kerry Sheedy played defense for the Hogs back in the early ’80s on some of the earliest lacrosse teams at Humboldt State. More than 30 years later, his son Dillon is the starting Hogs goalie, making the Sheedy clan the first family to have two generations play lacrosse for HSU. After a stand-out rookie season, Dillon lead all WCLL Div II goalies in saves per game (18.4) and ground balls (16) and earned All-WCLL Div II honorable mention. During the season, Dillon was named a team captain; heading into his second season, he’ll also be club president. We caught up with Dillon at his parents’ home in Truckee on Father’s Day. How’s it feel to be the first former Hog to have a son playing on the Humboldt lacrosse team? Kerry: I think it’s cool. Dillon played for me when we started the program up here in Truckee in 2004 and I coached him through high school. My wife and I, we made almost made half of the games this year, didn’t we? K: Yeah, more than half the games and so it was really cool. Some of the best memories I have of college were the lacrosse road trips. It was a good excuse to get out of Humboldt. 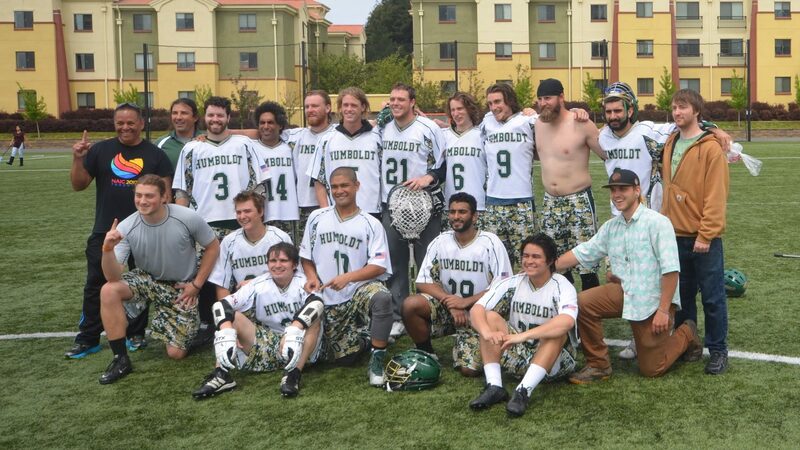 Knowing what you did on those road trips, you still wanted your son to play lacrosse at Humboldt State? K: (laughing) Yeah, well, you know, I’m sure they’re one-upping me but they don’t go to the same school we went to necessarily. But I remember Chico State, we were there during Pioneer Week and had a lacrosse game — and that was wild. The Santa Barbara tournament that we went down to where the van broke down and we ended up sleeping on the beach in Santa Barbara and being woken up by park rangers in the middle of the night. But it was good times, great times actually. 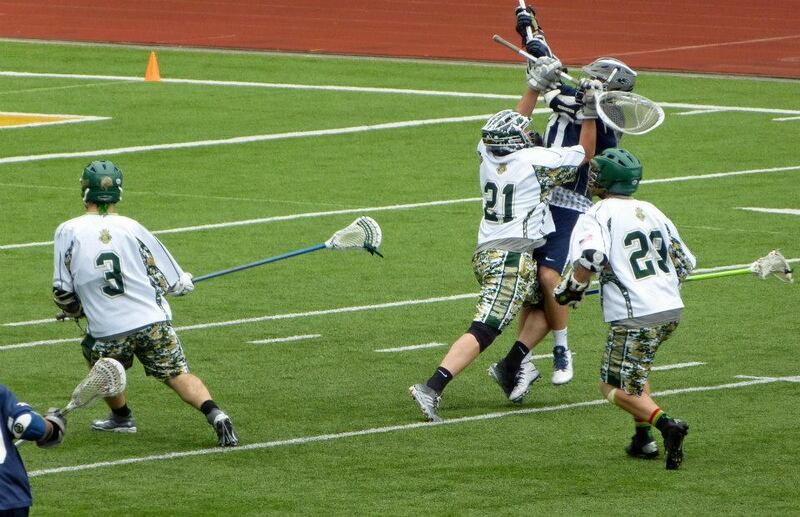 So, Dillon, you obviously didn’t start playing lacrosse at HSU. When did you start? D: I started playing lacrosse, I guess, I was like 10. We basically started the Truckee program with all the parents and kept it going through high school. We started playing youth lacrosse and then got a club team going up here in Truckee, which was the first time there was a club team or any kind of lacrosse team in this town. Now it’s actually pretty big up here and we have a lot of players out there. It’s kind of sprouted into a big program, which is kind of cool. Were you a goalie in high school? D: When I started playing lacrosse, I was an attackman and a midfielder. I guess it turned out that I was the only one that wouldn’t flinch when the ball came at me so I turned out being a goalie instead. I had a good goalie coach pretty much through my youth and high school, so pretty much all five years through high school I was a starting goalie. K: Curt Wegener was his coach, who’s actually the goalie coach for UNR. He played at Syracuse and he’s the one that runs the whole lacrosse tournament at Incline Village every summer. That’s kind of his baby. And then there’s another guy — Steve Corrigan. D: Yeah I played goalie for five years — I was on my high school team for five years — I started playing there when I was in eighth grade and it was a good experience for sure. And obviously my father was coaching me, and a family friend, and a bunch of my friends played on the team too and it was good times. And I’m guessing having players like Danny Balok and Cole Aylward probably helped you as a goalie as well. D: Yeah. Having someone who can handle the ball is definitely nice. There were definitely a few games this year where the ball was on the offensive side the whole game and it’s really nice when the offense can control it. D: Yeah in practice going up against those guys, good shooters, Cole and Danny and even the other kids, like Tyler Grant. 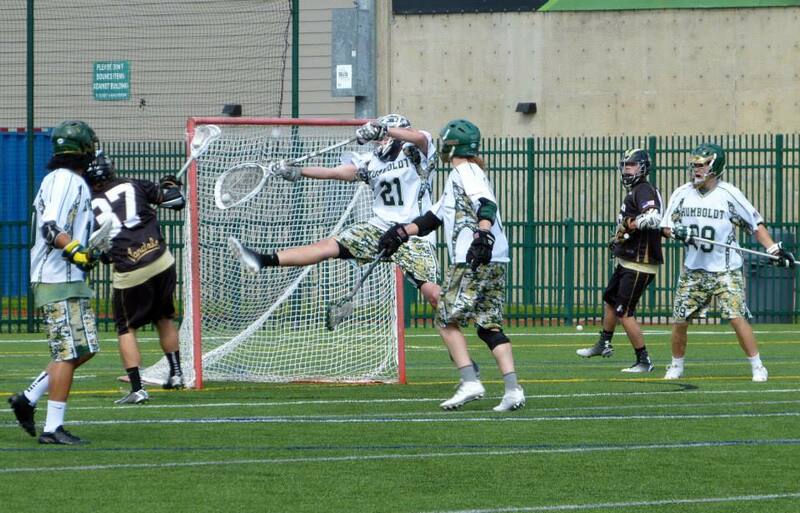 When you have good attackmen like that, it definitely makes it fun to be a goalie because you get good practice time and get good reps so it was definitely competitive at practice with those guys shooting on cage against me. That’s always fun. I didn’t really have that in high school — two of the best players in the league at every practice. How would you describe last season? D: It was a lot of fun. We had a group of 10 kids that could really play lacrosse really well. I honestly felt if we had five or six more kids we could have easily beat — I mean we were beating UNR going into the fourth quarter. We could have beat UCSC. We were playing against teams that had 30 players on their team and we had 15, 16 at the games. At the end of the season we had 12, 13 kids. We had a really solid group of 10 kids and most of those kids are coming back which is exciting. But that group of 10 kids are good lacrosse players and really could make things happen out there. We just kind of ran out of gas this year a couple of times. Sounds like you need to get that Truckee pipeline going and start feeding players to HSU. K: Oh yeah. We got a defenseman coming up next season that used to play with Dillon. He’s transferring up from Cuesta. Trevor Houghton. He’ll be a good asset to the team. Solid defender, very consistent. And we’re always trying to recruit kids to go up there and play. Was there any doubt in your mind, Dillon, that you were going to Humboldt? Or were you looking at other schools too? D: Honestly, Humboldt wasn’t really on my radar for a while. I went to Santa Barbara City College out of high school, played club lacrosse down there for a year. That was fun. Then I ended up playing football there in Santa Barbara for a year and got recruited to go up to Humboldt to play football and that was kind of the reason why I was going up there. Football just didn’t really work out, it wasn’t a good situation, and I knew I could play lacrosse and start and have a good time. So I’m definitely happy with my choice. Being a football player, you’re really physical. Is it tough being in goal and knowing you have to restrain yourself sometimes? D: And I definitely still am one of those goalies. I like to come out and lay some hits. I had a couple of good hits this year. Unfortunately, I definitely have to restrain myself now because I can’t take those penalties any more. It hurts the team too much. I have to pick and choose but that’s my favorite part about playing goalie — coming out and protecting the crease. They don’t really ever expect it so it’s always a big hit. It’s fun. Was it fun to watch Dillon wearing the green and gold? K: Oh yeah. It brings back a lot of good memories. And he had a good year. He definitely had a good impact on the team, a first-year captain and stuff like that. And I told (head coach) Tony (Silvaggio) that Dillon was an impact player and could make a difference in the crease or in the goal. Up here we always kind of let the goalie make the call on defense. Dillon’s also coached youth lacrosse so it’s tough because he wanted to step in there and coach but I think it’s also tough because you’re still a player. But I think he’s a good leader on the field for the defense. A lot of times in the games there were just some goals, they were just so close, there’s not much you can do. But they definitely got better towards the end of the year. They were definitely playing better together and that was great to see because that was always something we preached — getting better each game. And I hear Dillon is quite the game film beast. D: I spent a lot of time watching film. I’m the president of the club now and I’m going to make sure that we have some mandatory film watching hours. That really helps out a lot; it helped me out a lot. I’m a big film watcher. I’ve watched film for football my whole life, so sitting down and watching three hours of film is really nothing to me. It really makes a difference and we appreciate the alumni who taped games. It really helps out. So what would you tell somebody who was on the fence about going to HSU? K: I think it’s a great experience, great place to go to school. And you could totally see the camaraderie amongst the players. They were all pretty tight with each other. It’s a good family kind of atmosphere. … But it’s a good fit. You know, Trevor (Houghton) couldn’t get into the kinesiology program at SLO and then we started talking to him about Humboldt. And both these kids originally got accepted into Humboldt right out of high school but went south first. But for a lot of kids it’s a good match. If you’re into the outdoors and you’re a fisherman and you like doing that stuff, it’s a huge thing. That was my draw to that area, fishing and stuff like that. D: My favorite part about the program is you can go to other places to play MCLA ball like Cal Poly, U of O or Oregon State, and you’re paying $2,500 to play lacrosse and there’s 40 people on the roster and you hardly ever play if you’re not that good. Come to Humboldt and we keep it cheap. Dues are never more than $1,000, more like $600 to $1,000, you get to play as much as you want and have a good time with good people. That’s what I would tell kids on the fence: Don’t pay $2,500 to play lacrosse. K: To ride the bench. How did you end up on the team, Kerry? K: I transferred there from College of the Redwoods at the same time with Mark Doodha and then actually Mark and I — I think he knew I had a lacrosse stick or something like that — and how we actually got hooked up to the whole lacrosse thing is we were walking across the Quad. We were going to go to the Depot to get a pitcher of beer and it was Club Day. And here was (John) Mahoney and (James) Kircher standing at the desk for the Humboldt State lacrosse club. I looked at Mahoney and right away I knew I could play lacrosse with that guy… and I knew I could drink beer with that guy too. Maybe not keep up but, you know. Great friendships are forged through being on a team with people, life-long friends. And then when you get back together with them and you haven’t seen them in a bunch of years, they’re still the same people and it’s really nice. Did you guys do anything special for Father’s Day? Dillon: I had to work. I took over a shift for Pops. Kerry: Yeah, he worked the bagel store so I had the day off. You own a bagel shop? K: Yeah, actually I started it with Mark (Doodha). After Mark and I graduated, he was a manager at a Big 5 and I was working in a sales position in the Bay Area. I had the idea to do the bagel store back in 1987 and Mark was kind of tired of doing the whole Big 5 thing so that’s when we got together in 1994 and started the bagel store. Influenced by Los Bagels I’m assuming? K: Totally. When I was in college I worked at the Crosswinds across the street and I always used to go over there and take my tips and go buy two jalapeño bagels and eat that. Even though I could eat the food (at Crosswinds) for free I would always go across the street to Los Bagels. But after college I moved up here and found myself always coming back (to Truckee), but it was tough. I wasn’t a contractor or a real estate agent so you kind of had to create your own job up here. And that’s where we came up with the bagel store — Truckee Bagel. Now there’s two locations in Truckee and now there’s two locations in Reno — I don’t own the Reno ones anymore — but when Mark was here we had expanded into the Reno market because we were selling a lot of bagels to casinos. So really, the bagel store was started by two lacrosse buddies.